A collision on the M1 Southbound at junction 31 has caused a number of lane closures and long delays. The collision happened at about 11am this morning, January 30, and will affect traffic for a number of hours. 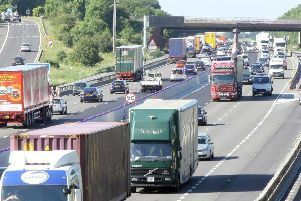 Initial suggestions from Highways England suggested that normal traffic flow would return between noon and 12.15pm. However an update suggests that usual traffic will return between 2pm and 2.15pm this afternoon.